Previously sold in our London Rooms, 6 June 2000, lot 341. This meiping is painted in the late 15th-century Ming 'windswept' style, which refers to the way in which the tabs of the scholars' caps and sash flutter in the breeze. This group of Ming vases were invariably painted with scholars or sages with attendant figures in fantastic cloudy landscapes, with decorative borders above and below the main band. The present vase is, without doubt, an 18th-century copy of two Chenghua-period meiping vases painted with identical scenes and secondary borders, and of the same slightly stout shape; one vase is from the Freer Gallery of Art, Washington D. C., illustrated in Oriental Ceramics, Kodansha Series, vol. 9, Japan, 1982, fig. 107, and the other was sold in these Rooms, 31 October 1994, lot 553 (fig. 1). 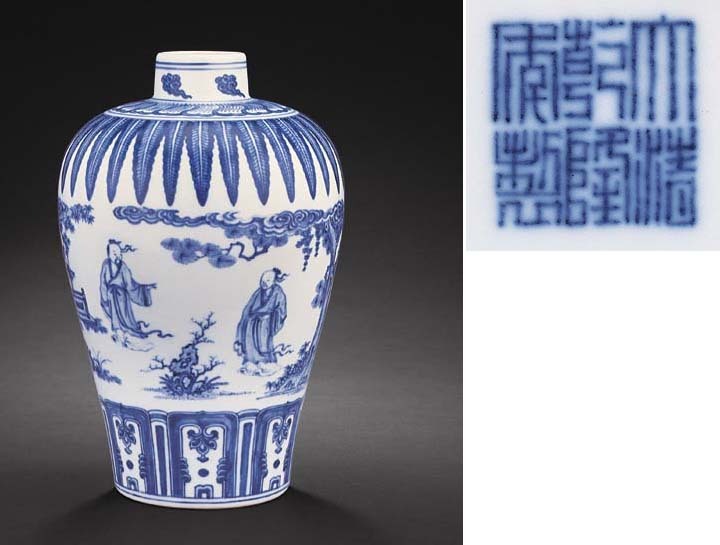 No other Qianlong vase of this design appears to be recorded. Cf. instead a few other late 15th-century meiping painted with this theme, two in the Shanghai Museum, illustrated by Wang Qingzheng (ed. ), Underglaze Blue and Red, Hong Kong, 1987, pls. 73 and 74; one from the collection of Mr. and Mrs. John A. Pope, included in the exhibition Ming Blue-and-white, Philadelphia Museum of Art, 1949, illustrated in the Philadelphia Museum Bulletin, vol. XLIV, no. 223, 1949, p. 53, no. 92; one from the Collection of Mr. and Mrs. R.H.R. Palmer, sold in these Rooms, 17 January 1989, lot 574; and another sold in our New York Rooms, 26 March 2003, lot 243.